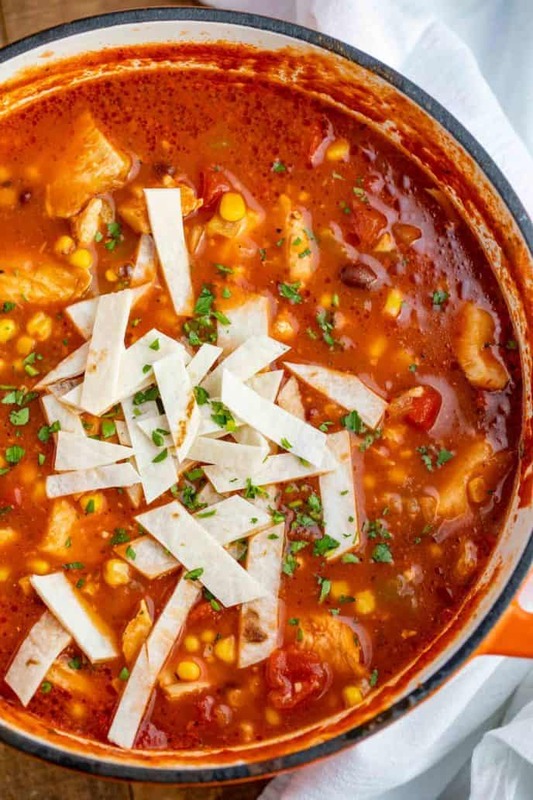 Chicken Tortilla Soup is super easy and quick, made with chicken, black beans, peppers, corn, crushed tomatoes and seasonings topped with tortilla strips and ready in 30 minutes! When the weather is cold, hot soup really hits the spot like some of our cold weather favorites Slow Cooker Beef Chili, Ultimate Slow Cooker Beef Stew and my crazy popular Ultimate Slow Cooker Pot Roast. 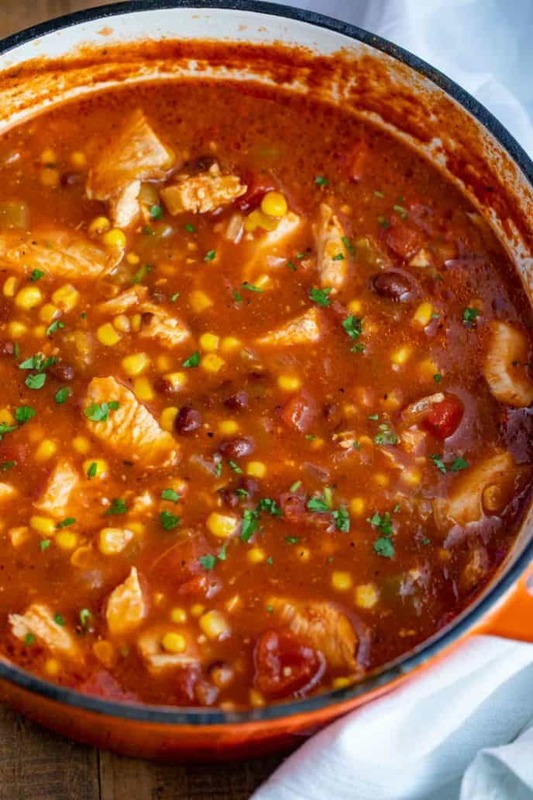 Chicken Tortilla Soup is the PERFECT dinner for a chilly night. It’s savory, hot, AND spicy, which warms you right to the bones. We make this all winter long, both on the stove and in the slow cooker. Plus it’s great for freezing, so I usually make a double batch and save half for a busy week. Trust me, once you try this homemade version, you’ll wonder why you ever had the store-bought one in your pantry to begin with! Whisk 3 tablespoons of corn starch into 1/2 cup cold water. Add to the soup and stir. It will thicken within a few minutes as the starch heats up. You can add more or less corn starch to get your desired consistency. Make a creamy chicken tortilla soup recipe by making a roux in the beginning. Melt 3 tablespoons of butter over medium heat. Add onions and 3 tablespoons of all purpose flour, whisking continuously. After 3-4 minutes, when flour starts to brown, slowly pour in broth and keep whisking while everything thickens. Then add remaining ingredients and follow the recipe as usual. At the very end, add 3/4 cup of heavy cream while stirring. 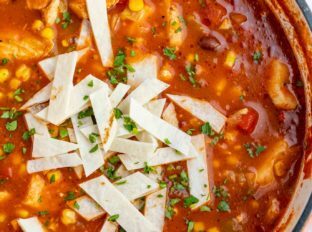 This chicken tortilla soup recipe is PERFECT for freezing, because it doesn’t contain dairy and reheats really well. 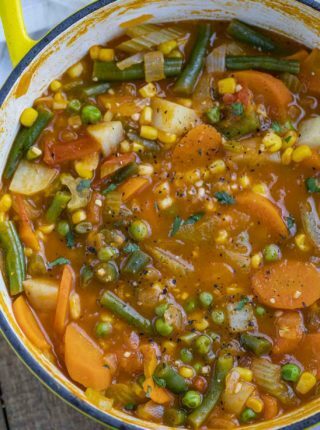 Cool the soup down completely, then store in a freezer-safe container. I like to freeze single serving containers for weekly lunches, too! HOW LONG DOES CHICKEN TORTILLA SOUP LAST IN THE FRIDGE? 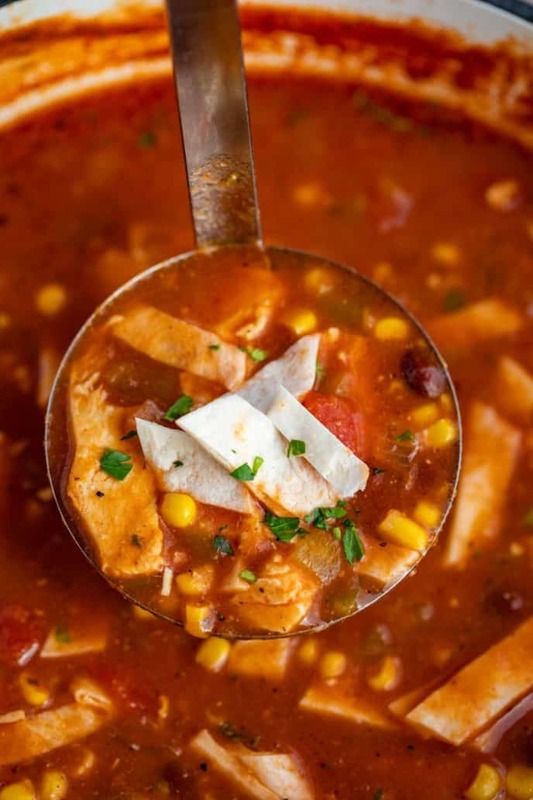 This chicken tortilla soup recipe will last in the refrigerator for 3-4 days in an airtight container. To reheat, pour into a saucepan over medium-low heat, stirring until warmed through. Add all ingredients to the slow cooker, except for tortillas. Cook on high for 4 hours, or on low for 8 hours. With 30 minutes remaining, remove chicken breast and shred with a fork. Add the chicken breast back into the soup and top with tortilla strips. Close the lid until the remaining time is up. Using the sauté function, add onions, spices, and oil until onions are translucent. Add everything except for the tortilla strips to the instant pot. Lock the lid in place and close the pressure valve. Set in manual mode on high for a total time of 10 minutes, then let it release naturally. Once the pressure is released, open the lid. Remove the chicken and shred with a fork, then add it back into the soup with the tortilla strips. Stir and serve. Top with cheddar or pepper jack cheese for a cheesy chicken tortilla soup. Instead of skinless chicken breast, this is a great recipe for using up leftover rotisserie chicken. Just shred the chicken, and add at the end, just to heat it through. Make this recipe gluten free by substituting gluten free corn tortilla chips instead of the flour tortillas. 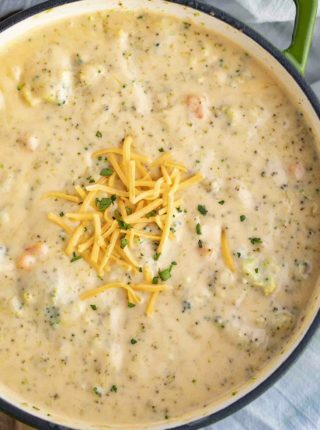 Serve this soup with fresh avocado, sour cream, jalapenos, cheddar cheese, cilantro, tortilla chips, and lime juice. Use diced jalapenos and fire-roasted tomatoes for an extra kick of spice! Chicken Tortilla Soup is savory and spicy, made with chicken, black beans, chile peppers, crushed tomatoes, seasoning, and tortilla strips, ready in under 45 minutes! Add the canola oil to a large dutch oven on medium heat and add the onion and garlic, cooking for 2 minutes until you can smell the garlic. 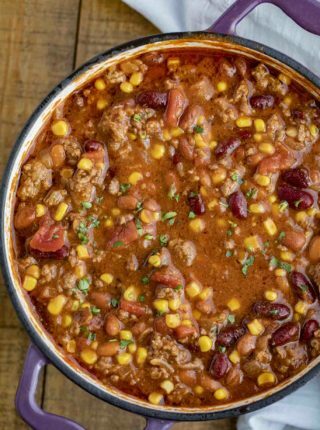 Add the green chiles, black beans, diced tomatoes, crushed tomatoes, corn, salt, pepper, cumin, chili powder, cayenne pepper, and oregano and mix well. Add the chicken broth, crushed tomatoes and chicken breasts and bring to a boil before reducing to a simmer for 22-25 minutes. Remove the chicken, shred with two forks, then return to the pot with the shredded tortillas and cilantro, stirring well before serving. I love this soup! I want a big bowl of this for dinner! Looks absolutely awesome! I bet those flavors are amazing, need to make this! I hope you enjoy it, Melanie! I love this soup! 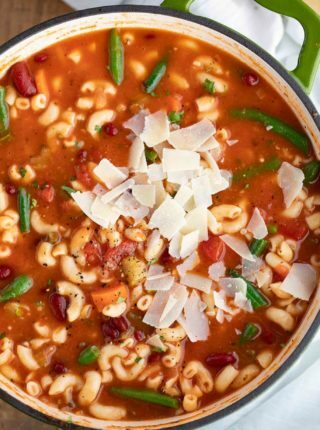 So hearty for winter!!! Yes, perfect for a cold day! Perfect for these chilly days! My family loves it! This looks absolutely amazing ! Perfect for those cold nights!! Perfect for that! Stay warm! This is easily the best soup I’ve ever made, thanks!